In Windows, a process is nothing more than a simple container of threads and metadata that represents a user-mode application. It has its own memory so that it can manage the different pieces of data and code that make the process do something useful. Let's consider, then, two processes that both try to read and write from the memory located at the virtual address 0x00000000`11223344. Based on what we know about paging, we expect that the virtual address is going to end up translating into the same physical address (let's say 0x00000001`ff003344 as an example) in both processes. There is, after all, only one CR3 register per processor, and the hardware dictates that the paging structure root is located in that register. 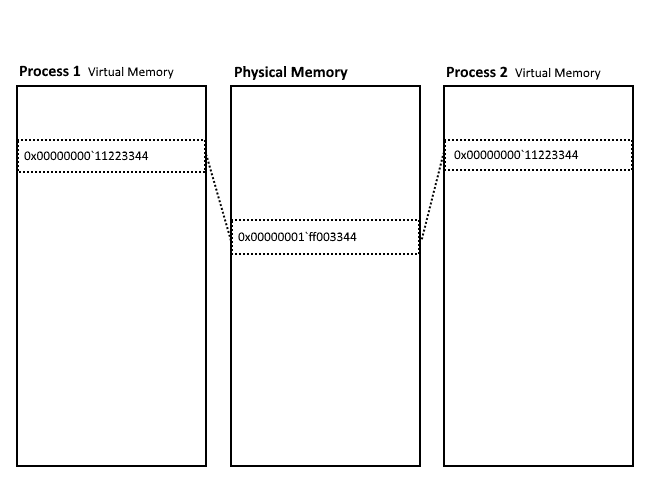 Figure 1: If the two process' virtual addresses would translate to the same physical address, then we expect that they would both see the same memory, right? Of course, in reality we know that it can't work that way. If we use one process to write to a virtual memory address, and then use another process to read from that address, we shouldn't get the same value. That would be devastating from a security and stability standpoint. In fact, the same permissions may not even be applied to that virtual memory in both processes. But how does Windows accomplish this separation? It's actually pretty straightforward: when switching threads in kernel-mode or user-mode (called a context switch), Windows stores off or loads information about the current thread including the state of all of the registers. Because of this, Windows is able to swap out the root of the paging structures when the thread context is switched by changing the value of CR3, effectively allowing it to manage an entirely separate set of paging structures for each process on the system. This gives each process a unique mapping of virtual memory to physical memory, while still using the same virtual address ranges as another process. The PML4 table pointer for each user-mode process is stored in the DirectoryTableBase member of an internal kernel structure called the EPROCESS, which also manages a great deal of other state and metadata about the process. Figure 2: In reality, each process has its own set of paging structures, and Windows swaps out the value of the CR3 register when it executes within that process. This allows virtual addresses in each process to map to different physical addresses. We can see the paging structure swap between processes for ourselves if we do a little bit of exploration using WinDbg. If you haven't already set up kernel debugging, you should check out this article to get yourself started. Then follow along below. Let's first get a list of processes running on the target system. We can do that using the !process command. For more details on how to use this command, consider checking out the documentation using .hh !process. In our case, we pass parameters of zero to show all processes on the system. We can use notepad.exe as our target process, but you should be able to follow along with virtually any process of your choice. The next thing we need to do is attach ourselves to this process - simply put, we need to be in this process' context. This lets us access the virtual memory of notepad.exe by remapping the paging structures. We can verify that the context switch is happening by watching what happens to the CR3 register. If the virtual memory we have access to is going to change, we expect that the value of CR3 will change to new paging structures that represent notepad.exe's virtual memory. Let's take a look at the value of CR3 before the context switch. We know that this value should change to the DirectoryTableBase member of the EPROCESS structure that represents notepad.exe when we make the switch. As a matter of interest, we can take a look at that structure and see what it contains. The PROCESS fffffa8019218b10 line emitted by the debugger when we listed all processes is actually the virtual address of that process' EPROCESS structure. The fully expanded EPROCESS structure is massive, so everything after what we're interested in has been omitted from the results above. We can see, though, that the DirectoryTableBase is a member at +0x028 of the process control block (KPROCESS) structure that's embedded as part of the larger EPROCESS structure. According to this output, we should expect that CR3 will change to 0x00000006`52e89000 when we switch to this process' context in WinDbg. To perform the context swap, we use the .process command and indicate that we want an invasive swap (/i) which will remap the virtual address space and allow us to do things like set breakpoints in user-mode memory. Also, in order for the process context swap to complete, we need to allow the process to execute once using the g command. The debugger will then break again, and we're officially in the context of notepad.exe. Okay! Now that we're in the context we need to be in, let's check the CR3 register to verify that the paging structures have been changed to the DirectoryTableBase member we saw earlier. Looks like it worked as we expected. We would find a unique set of paging structures at 0x00000006`52e89000 that represented the virtual to physical address mappings within notepad.exe. This is essentially the same kind of swap that occurs each time Windows switches to a thread in a different process. While each process gets its own view of virtual memory and can re-use the same virtual address range as another process, there are some consistent rules of thumb that Windows abides by when it comes to which virtual address ranges store certain kinds of information. To start, each user-mode process is allowed a user-mode virtual address space ranging from 0x000`00000000 to 0x7ff`ffffffff, giving each process a theoretical maximum of 8TB of virtual memory that it can access. Then, each process also has a range of kernel-mode virtual memory that is split up into a number of different subsections. This much larger range gives the kernel a theoretical maximum of 248TB of virtual memory, ranging from 0xffff0800`00000000 to 0xffffffff`ffffffff. The remaining address space is not actually used by Windows, though, as we can see below. 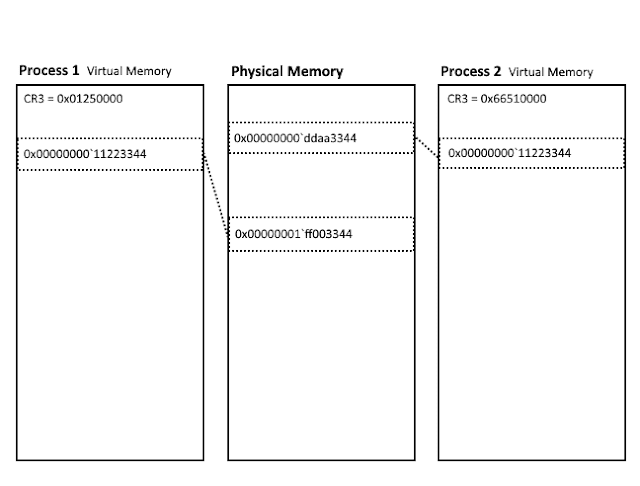 Figure 3: All possible virtual memory, divided into the different ranges that Windows enforces. The virtual addresses for the kernel-mode regions may not be true on Windows 10, where these regions are subject to address space layout randomization (ASLR). Credits to Alex Ionescu for specific kernel space mappings. Currently, there is an extremely large “no man's land” of virtual memory space between the user-mode and kernel-mode ranges of virtual memory. This range of memory isn't wasted, though, it's just not addressable due to the current architecture constraint of 48-bit virtual addresses, which we discussed in our previous article. If there existed a system with 16EB of physical memory - enough memory to address all possible 64-bit virtual memory - the extra physical memory would simply be used to hold the pages of other processes, so that many processes' memory ranges could be resident in physical memory at once. As an aside, one other interesting property of the way Windows handles virtual address mapping is being able to quickly tell kernel pointers from user-mode pointers. Memory that is mapped as part of the kernel has the highest order bits of the address (the 16 bits we didn't use as part of the linear address translation) set to 1, while user-mode memory has them set to 0. This ensures that kernel-mode pointers begin with 0xFFFF and user-mode pointers begin with 0x0000. We can see that the kernel-mode virtual memory is nicely divided into different sections. But what about user-mode memory? How does the memory manager know which portions of virtual memory have been allocated, which haven't, and details about each of those ranges? How can it know if a virtual address within a process is valid or invalid? It could walk the process' paging structures to figure this out every time the information was needed, but there is another way: the virtual address descriptor (VAD) tree. Each process has a VAD tree that can be located in the VadRoot member of the aforementioned EPROCESS structure. The tree is a balanced binary search tree, with each node representing a region of virtual memory within the process. 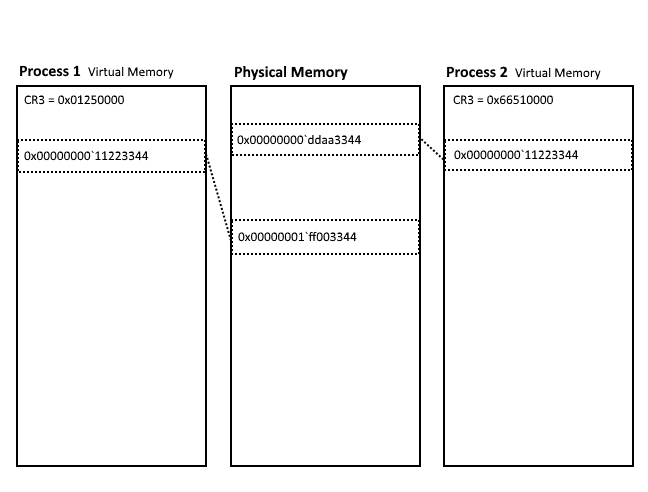 Figure 4: The VAD tree is balanced with lower virtual page numbers to the left, and each node providing some additional details about the memory range. Each node gives details about the range of addresses, the memory protection of that region, and some other metadata depending on the state of the memory it is representing. We can use our friend WinDbg to easily list all of the entries in the VAD tree of a particular process. Let's have a look at the VAD entries from notepad.exe using !vad. The range of addresses supported by a given VAD entry are stored as virtual page numbers - similar to a PFN, but simply in virtual memory. This means that an entry representing a starting VPN of 0x7f and an ending VPN of 0x8f would actually be representing virtual memory from address 0x00000000`0007f000 to 0x00000000`0008ffff. There are a number of complexities of the VAD tree that are outside the scope of this article. For example, each node in the tree can be one of three different types depending on the state of the memory being represented. In addition, a VAD entry may contain information about the backing PTEs for that region of memory if that memory is shared. We will touch more on that concept in a later section. That's where the page frame number (PFN) database comes in. A pointer to the base of this very large structure can be located at the symbol nt!MmPfnDatabase, but we know based on the kernel-mode memory ranges that it starts at the virtual address 0xfffffa80`00000000, except on Windows 10 where this is subject to ASLR. (As an aside, WinDbg has a neat extension for dealing with the kernel ASLR in Windows 10 - !vm 0x21 will get you the post-KASLR regions). For each physical page available on the system, there is an nt!_MMPFN structure allocated in the database to provide details about the page. 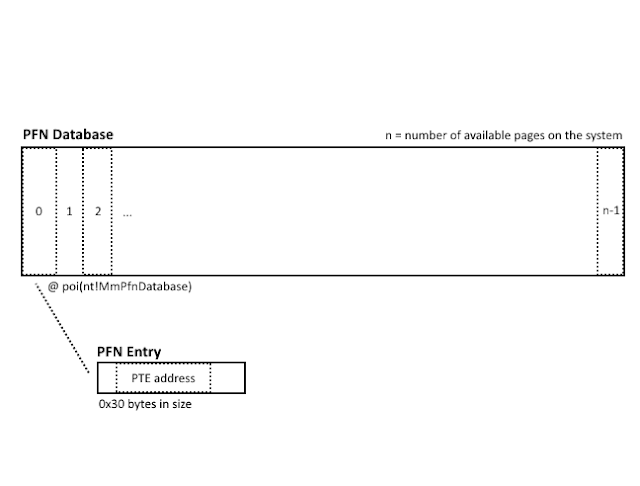 Figure 5: Each physical page in the system is represented by a PFN entry structure in this very large, contiguous data structure. A page represented in the PFN database can be in a number of different states. The state of the page will determine what the memory manager does with the contents of that page. We won't be focusing on the different states too much in this article, but there are a few of them: active, transition, modified, free, and bad, to name several. It is definitely worth mentioning that for efficiency reasons, Windows manages linked lists that are comprised of all of the nt!_MMPFN entries that are in a specific state. This makes it much easier to traverse all pages that are in a specific state, rather than having to walk the entire PFN database. For example, it can allow the memory manager to quickly locate all of the free pages when memory needs to be paged in from disk. Figure 6: Different linked lists make it easier to walk the PFN database according to the state of the pages, e.g. walk all of the free pages contiguously. Another purpose of the PFN database is to help facilitate the translation of physical addresses back to their corresponding virtual addresses. Windows uses the PFN database to accomplish this during calls such as nt!MmGetVirtualForPhysical. While it is technically possible to search all of the paging structures for every process on the system in order to work backwards up the paging structures to get the original virtual address, the fact that the nt!_MMPFN structure contains a reference to the backing PTE coupled with some clever allocation rules by Microsoft allow them to easily convert back to a virtual address using the PTE and some bit shifting. For a little bit of practical experience exploring the PFN database, let's find a region of memory in notepad.exe that we can take a look at. One area of memory that could be of interest is the entry point of our application. We can use the !dh command to display the PE header information associated with a given module in order to track down the address of the entry point. Again, the output is quite verbose, so the section information at the bottom is omitted from the above snippet. We're interested in the address of entry point member of the optional header, which is listed as 0x3acc. That value is called a relative virtual address (RVA), and it's the number of bytes from the base address of the notepad.exe image. If we add that relative address to the base of notepad.exe, we should see the code located at our entry point. And we do see that the address resolves to notepad!WinMainCRTStartup, like we expected. Now we have the address of our target process' entry point: 00000000`ffd53acc. While the above steps were a handy exercise in digging through parts of a loaded image, they weren't actually necessary since we had symbols loaded. We could have simply used the ? qualifier in combination with the symbol notepad!WinMainCRTStartup, as demonstrated below, or gotten the value of a handy pseudo-register that represents the entry point with r $exentry. In any case, we now have the address of our entry point, which from here on we'll refer to as our “target” or the “target page”. We can now start taking a look at the different paging structures that support our target, as well as the PFN database entry for it. Let's first take a look at the PFN database. We know the virtual address where this structure is supposed to start, but let's look for it the long way, anyway. We can easily find the beginning of this structure by using the ? qualifier and poi on the symbol name. The poi command treats its parameter as a pointer and retrieves the value located at that pointer. Knowing that the PFN database begins at 0xfffffa80`00000000, we should be able to index easily to the entry that represents our target page. First we need to figure out the page frame number in physical memory that the target's PTE refers to, and then we can index into the PFN database by that number. Looking back on what we learned from the previous article, we can grab the PTE information about the target page very easily using the handy !pte command. The above result would indicate that the backing page frame number for the target is 0x65207b. That should be the index into the PFN database that we'll need to use. Remember that we'll need to multiply that index by the size of an nt!_MMPFN structure, since we're essentially trying to skip that many PFN entries. This looks like a valid PFN entry. We can verify that we've done everything correctly by first doing the manual calculation to figure out what the address of the PFN entry should be, and then comparing it to where WinDbg thinks it should be. So based on the above, we know that the nt!_MMPFN entry for the page we're interested in it should be located at 0xfffffa80`12f61710, and we can use a nice shortcut to verify if we're correct. As always in WinDbg, there is an easier way to obtain information from the PFN database. This can be done by using the !pfn command with the page frame number. Here we can see that WinDbg also indicates that the PFN entry is at 0xfffffa8012f61710, just like our calculation, so it looks like we did that correctly. Phew - we've done some digging around in the PFN database now, and we've seen how each entry in that database stores some information about the physical page itself. Let's take a step back for a moment, back into the world of virtual memory, and talk about working sets. Each process has what's called a working set, which represents all of the process' virtual memory that is subject to paging and is accessible without incurring a page fault. Some parts of the process' memory may be paged to disk in order to free up RAM, or in a transition state, and therefore accessing those regions of memory will generate a page fault within that process. In layman's terms, a page fault is essentially the architecture indicating that it can't access the specified virtual memory, because the PTEs needed for translation weren't found inside the paging structures, or because the permissions on the PTEs restrict what the application is attempting to do. When a page fault occurs, the page fault handler must resolve it by adding the page back into the process' working set (meaning it also gets added back into the process' paging structures), mapping the page back into memory from disk and then adding it back to the working set, or indicating that the page being accessed is invalid. 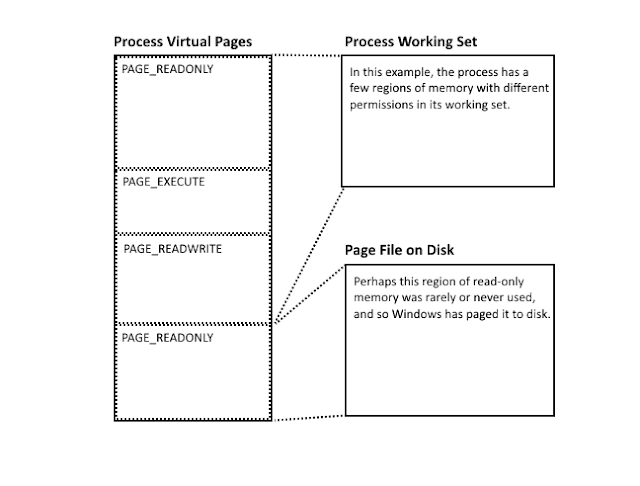 Figure 7: An example working set of a process, where some rarely accessed pages were paged out to disk to free up physical memory. It should be noted that other regions of virtual memory may be accessible to the process which do not appear in the working set, such as Address Windowing Extensions (AWE) mappings or large pages; however, for the purposes of this article we will be focusing on memory that is part of the working set. Occasionally, Windows will trim the working set of a process in response to (or to avoid) memory pressure on the system, ensuring there is memory available for other processes. If the working set of a process is trimmed, the pages being trimmed have their backing PTEs marked as “not valid” and are put into a transition state while they await being paged to disk or given away to another process. In the case of a “soft” page fault, the page described by the PTE is actually still resident in physical memory, and the page fault handler can simply mark the PTE as valid again and resolve the fault efficiently. Otherwise, in the case of a “hard” page fault, the page fault handler needs to fetch the contents of the page from the paging file on disk before marking the PTE as valid again. If this kind of fault occurs, the page fault handler will likely also have to alter the page frame number that the PTE refers to, since the page isn't likely to be loaded back into the same location in physical memory that it previously resided in. It's important to remember that while two processes do have different paging structures that map their virtual memory to different parts of physical memory, there can be portions of their virtual memory which map to the same physical memory. This concept is called shared memory, and it's actually quite common within Windows. In fact, even in our previous example with notepad.exe's entry point, the page of memory we looked at was shared. Examples of regions in memory that are shared are system modules, shared libraries, and files that are mapped into memory with CreateFileMapping() and MapViewOfFile(). 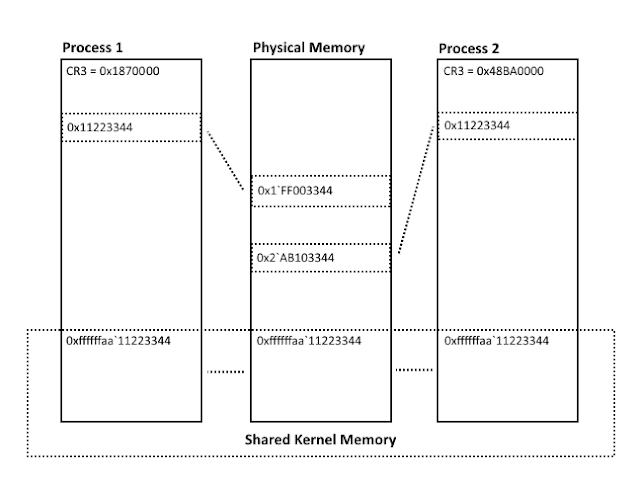 In addition, the kernel-mode portion of a process' memory will also point to the same shared physical memory as other processes, because a shared view of the kernel is typically mapped into every process. Despite the fact that a view of the kernel is mapped into their memory, user-mode applications will not be able to access pages of kernel-mode memory as Windows sets the UserSupervisor bit in the kernel-mode PTEs. The hardware uses this bit to enforce ring0-only access to those pages. Figure 8: Two processes may have different views of their user space virtual memory, but they get a shared view of the kernel space virtual memory. In the case of memory that is not shared between processes, the PFN database entry for that page of memory will point to the appropriate PTE in the process that owns that memory. Figure 9: When not sharing memory, each process will have PTE for a given page, and that PTE will point to a unique member of the PFN database. When dealing with memory that is shareable, Windows creates a kind of global PTE - known as a prototype PTE - for each page of the shared memory. This prototype always represents the real state of the physical memory for the shared page. If marked as Valid, this prototype PTE can act as a hardware PTE just as in any other case. If marked as Not Valid, the prototype will indicate to the page fault handler that the memory needs to be paged back in from disk. When a prototype PTE exists for a given page of memory, the PFN database entry for that page will always point to the prototype PTE. Figure 10: Even though both processes still have a valid PTE pointing to their shared memory, Windows has created a prototype PTE which points to the PFN entry, and the PFN entry now points to the prototype PTE instead of a specific process. Why would Windows create this special PTE for shared memory? 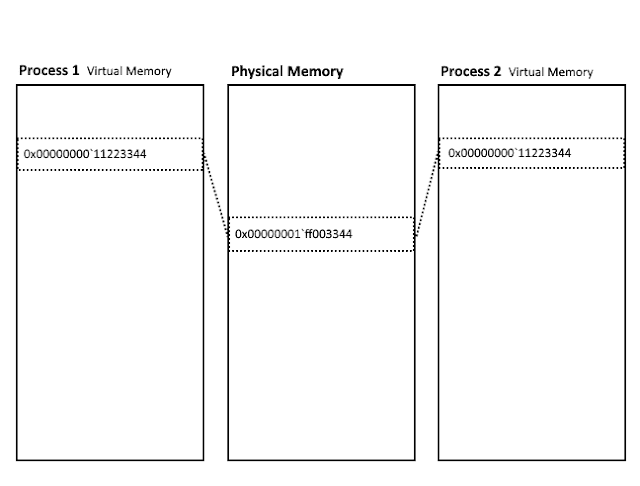 Well, imagine for a moment that in one of the processes, the PTE that describes a shared memory location is stripped out of the process' working set. If the process then tries to access that memory, the page fault handler sees that the PTE has been marked as Not Valid, but it has no idea whether that shared page is still resident in physical memory or not. For this, it uses the prototype PTE. When the PTE for the shared page within the process is marked as Not Valid, the Prototype bit is also set and the page frame number is set to the location of the prototype PTE for that page. 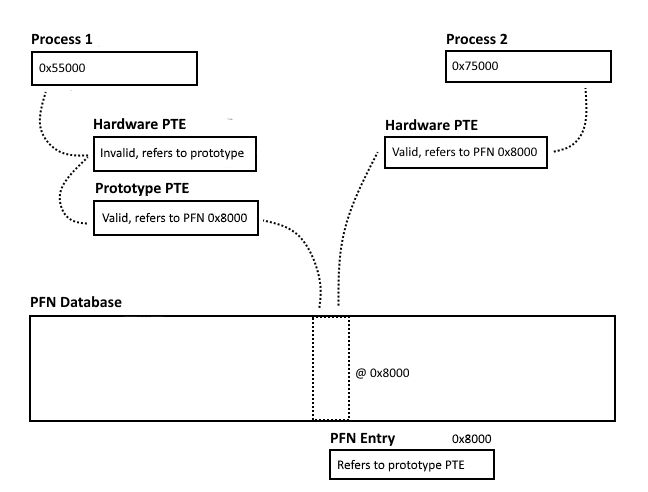 Figure 11: One of the processes no longer has a valid PTE for the shared memory, so Windows instead uses the prototype PTE to ascertain the true state of the physical page. This way, the page fault handler is able to examine the prototype PTE to see if the physical page is still valid and resident or not. If it is still resident, then the page fault handler can simply mark the process' version of the PTE as valid again, resolving the soft fault. If the prototype PTE indicates it is Not Valid, then the page fault handler must fetch the page from disk. We can continue our adventures in WinDbg to explore this further, as it can be a tricky concept. 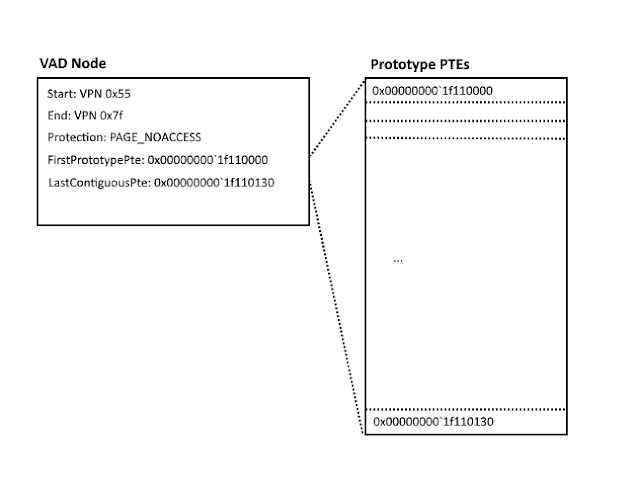 Based on what we know about shared memory, that should mean that the PTE referenced by the PFN entry for the entry point of notepad.exe is a prototype PTE. We can already see that it's a different address (0xfffff8a0`09e25a00) than the PTE that we were expecting from the !pte command (0xfffff680007fea98). Let's look at the fully expanded nt!_MMPTE structure that's being referenced in the PFN entry. We can compare that with the nt!_MMPTE entry that was referenced when we did the !pte command on notepad.exe's entry point. It looks like the Prototype bit is not set on either of them, and they're both valid. This makes perfect sense. The shared page still belongs to notepad.exe's working set, so the PTE in the process' paging structures is still valid; however, the operating system has proactively allocated a prototype PTE for it because the memory may be shared at some point and the state of the page will need to be tracked with the prototype PTE. The notepad.exe paging structures also point to a valid hardware PTE, just not the same one as the PFN database entry. The same isn't true for a region of memory that can't be shared. For example, if we choose another memory location that was allocated as MEM_PRIVATE, we will not see the same results. We can use the !vad command to give us all of the virtual address regions (listed by virtual page frame) that are mapped by the current process. We can take a look at a MEM_PRIVATE page, such as 0x1cf0, and see if the PTE from the process' paging structures matches the PTE from the PFN database. As we can see, it does match, with both addresses referring to 0xfffff680`0000e780. Because this memory is not shareable, the process' paging structures are able to manage the hardware PTE directly. In the case of shareable pages allocated with MEM_MAPPED, though, the PFN database maintains its own copy of the PTE. It's worth exploring different regions of memory this way, just to see how the paging structures and PFN entries are set up in different cases. As mentioned above, the VAD tree is another important consideration when dealing with user-mode memory as in many cases, it will actually be a VAD node which indicates where the prototype PTE for a given shared memory region resides. In these cases, the page fault handler will need to refer to the process' VAD tree and walk the tree until it finds the node responsible for the shared memory region. 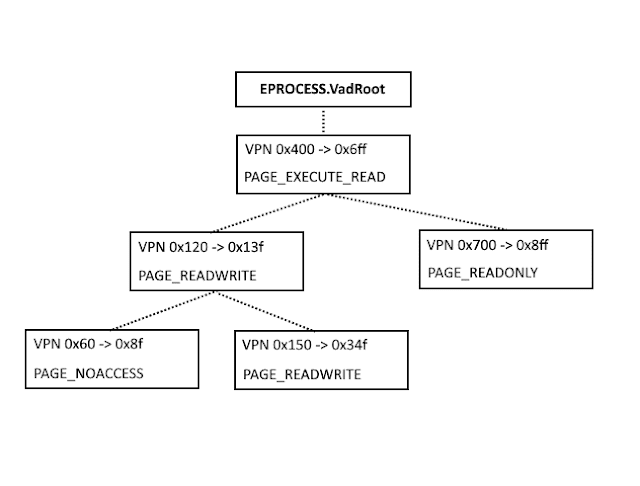 Figure 12: If the invalid PTE points to the process' VAD tree, a VAD walk must be performed to locate the appropriate _MMVAD node that represents the given virtual memory. The FirstPrototypePte member of the VAD node will indicate the starting virtual address of a region of memory that contains prototype PTEs for each shared page in the region. The list of prototype PTEs is terminated with the LastContiguousPte member of the VAD node. The page fault handler must then walk this list of prototype PTEs to find the PTE that backs the specific page that has faulted. 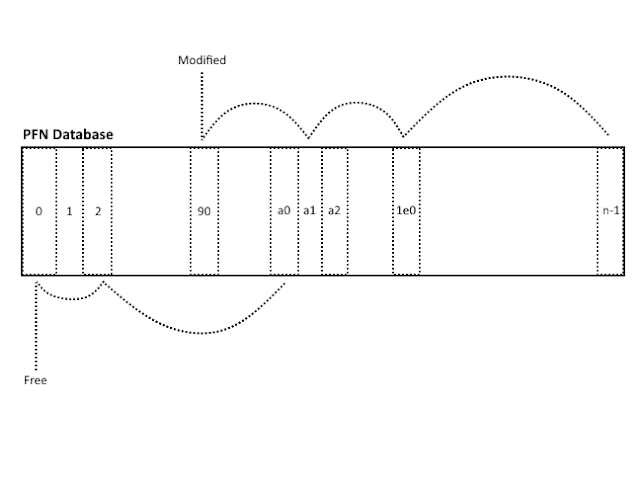 Figure 13: The FirstPrototypePte member of the VAD node points to a region of memory that has a contiguous block of prototype PTEs that represent shared memory within that virtual address range. It would be helpful to walk through each of these scenarios with a program that we control, and that we can change, if needed. That's precisely what we're going to do with the memdemo project. You can follow along by compiling the application yourself, or you can simply take a look at the code snippets that will be posted throughout this example. To start off, we'll load our memdemo.exe and then attach the kernel debugger. We then need to get a list of processes that are currently running on the system. Let's quickly switch back to the application so that we can let it create our initial buffer. To do this, we're simply allocating some memory and then accessing it to make sure it's resident. Upon running the code, we see that the application has created a buffer for us (in the current example) at 0x000001fe`151c0000. Your buffer may differ. We should hop back into our debugger now and check out that memory address. As mentioned before, it's important to remember to switch back into the process context of memdemo.exe when we break back in with the debugger. We have no idea what context we could have been in when we interrupted execution, so it's important to always do this step. When we wrote memdemo.exe, we could have used the __debugbreak() compiler intrinsic to avoid having to constantly switch back to our process' context. It would ensure that when the breakpoint was hit, we were already in the correct context. For the purposes of this article, though, it's best to practice swapping back into the correct process context, as during most live analysis we would not have the liberty of throwing int3 exceptions during the program's execution. We can now check out the memory at 0x000001fe`151c0000 using the db command. Looks like that was a success - we can even see the 0xff byte that we wrote to it. Let's have a look at the backing PTE for this page using the !pte command. That's good news. It seems like the Valid (V) bit is set, which is what we expect. The memory is Writeable (W), as well, which makes sense based on our PAGE_READWRITE permissions. Let's look at the PFN database entry using !pfn for page 0xa1dd0. We can see that the PFN entry points to the same PTE structure we were just looking at. We can go to the address of the PTE at 0xffffed00ff0a8e00 and cast it as an nt!_MMPTE. We see that it's Valid, Dirty, Accessed, and Writeable, which are all things that we expect. The Accessed bit is set by the hardware when the page table entry is used for translation. If that bit is set, it means that at some point the memory has been accessed because the PTE was used as part of an address translation. Software can reset this value in order to track accesses to certain memory. Similarly, the Dirty bit shows that the memory has been written to, and is also set by the hardware. We see that it's set for us because we wrote our 0xff byte to the page. Once that's complete, don't forget to switch back to the process context again. We need to do that every time we go back into the debugger! Now let's check out the PTE with the !pte command after the page has been supposedly trimmed from our working set. We see now that the PTE is no longer valid, because the page has been trimmed from our working set; however, it has not been paged out of RAM yet. This means it is in a transition state, as shown by WinDbg. We can verify this for ourselves by looking at the actual PTE structure again. In the _MMPTE_TRANSITION version of the structure, the Transition bit is set. So because the memory hasn't yet been paged out, if our program were to access that memory, it would cause a soft page fault that would then simply mark the PTE as valid again. If we examine the PFN entry with !pfn, we can see that the page is still resident in physical memory for now, and still points to our original PTE. Now let's press g again and let the app continue. It'll create a shared section of memory for us. In order to do so, we need to create a file mapping and then map a view of that file into our process. Let's take a look at the shared memory (at 0x000001fe`151d0000 in this example) using db. Don't forget to change back to our process context when you switch back into the debugger. And look! There's the 0xff that we wrote to this memory region as well. We're going to follow the same steps that we did with the previous allocation, but first let's take a quick look at our process' VAD tree with the !vad command. You can see the first allocation we did, starting at virtual page number 0x1fe151c0. It's a Private region that has the PAGE_READWRITE permissions applied to it. You can also see the shared section allocated at VPN 0x1fe151d0. It has the same permissions as the non-shared region; however, you can see that it's Mapped rather than Private. Let's take a look at the PTE information that's backing our shared memory. This region, too, is Valid and Writeable, just like we'd expect. Now let's take a look at the !pfn. We see that the Share Count now actually shows us how many times the page has been shared, and the page also has the Shared property. In addition, we see that the PTE address referenced by the PFN entry is not the same as the PTE that we got from the !pte command. That's because the PFN database entry is referencing a prototype PTE, while the PTE within our process is acting as a hardware PTE because the memory is still valid and mapped in. Let's take a look at the PTE structure that's in our process' paging structures, that was originally found with the !pte command. We can see that it's Valid, so it will be used by the hardware for address translation. Let's see what we find when we take a look at the prototype PTE being referenced by the PFN entry. This PTE is also valid, because it's representing the true state of the physical page. Something interesting to note, though, is that you can see that the Dirty bit is not set. Because this bit is only set by the hardware in the context of whatever process is doing the writing, you can theoretically use this bit to actually detect which process on a system wrote to a shared memory region. Let's take a look at the memory with db now. We see now that it's no longer visible in our process. If we do !pte on it, let's see what we get. The PTE that's backing our page is no longer valid. We still get an indication of what the page permissions were, but the PTE now tells us to refer to the process' VAD tree in order to get access to the prototype PTE that contains the real state. If you recall from when we used the !vad command earlier in our example, the address of the VAD node for our shared memory is 0xffffa50d`d2313a20. Let's take a look at that memory location as an nt!_MMVAD structure. The FirstPrototypePte member contains a pointer to a location in virtual memory that stores contiguous prototype PTEs for the region of memory represented by this VAD node. Since we only allocated (and subsequently paged out) one page, there's only one prototype PTE in this list. The LastContiguousPte member shows that our prototype PTE is both the first and last element in the list. Let's take a look at this prototype PTE as an nt!_MMPTE structure. We can see that the prototype indicates that the memory is no longer valid. So what can we do to force this page back into memory? We access it, of course. Let's let the app run one more step so that it can try to access this memory again. 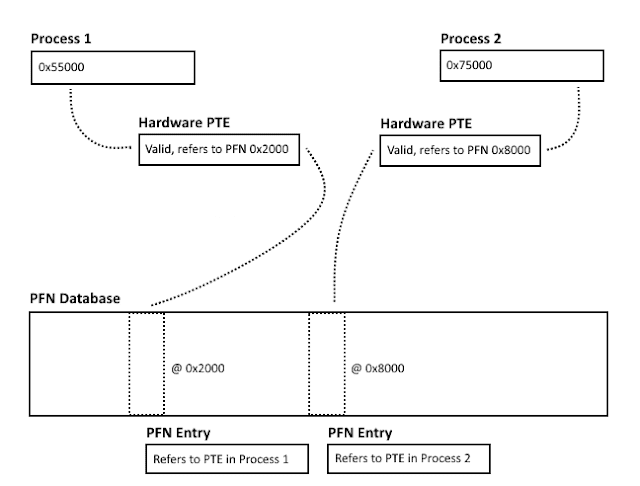 Remember to switch back into the context of the process after the application has executed the next step, and then take a look at the PTE from the PFN entry again. Looks like it's back, just like we expected! Exhausted yet? 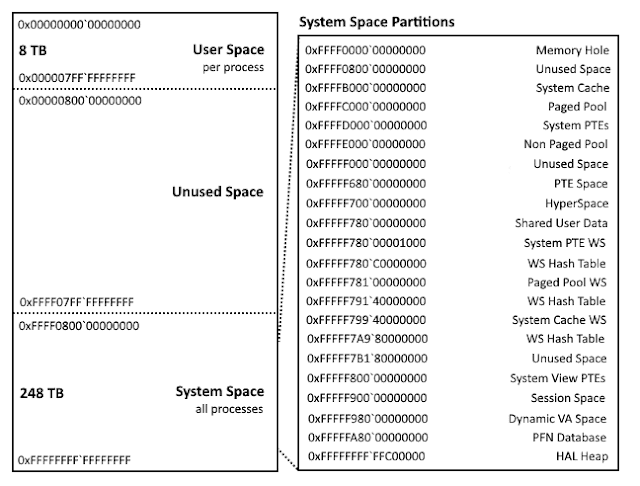 Compared to the 64-bit paging scheme we talked about in our last article, Windows memory management is significantly more complex and involves a lot of moving parts. But at it's core, it's not too daunting. Hopefully, now with a much stronger grasp of how things work under the hood, we can put our memory management knowledge to use in something practical in a future article. If you're interested in getting your hands on the code used in this article, you can check it out on GitHub and experiment on your own with it. Consider picking up a copy of "Windows Internals, 7th Edition" or "What Makes It Page?" to get an even deeper dive on the Windows virtual memory manager. Thank you to Alex Ionescu for additional tips and clarification. Thanks to irqlnotdispatchlevel for pointing out an address miscalculation. Nice basic overview. There’s a few good books you may want to reference for readers that want to go deeper —� “How Does It Page?” and “Windows Internals”. FWIW, the table on my blog contains a much more accurate and up to date kernel address space as ofWindows 8.1 and Windows 10 pre-Anniversary Update prior to KASLR. You may want to use that information over the older CM post... additionally WinDBG has the !vm 0x21 extension which will dump the Win10 KASLR address ranges. It’s worth talking about the different kernel system VA types for a better understanding of what goes on there (but I understand this post mostly focused on user mode). One last comment — the working set does not describe the “full” set of pages that can be accessed without a page fault (note: a description if soft vs hard page faults may have been useful), but rather only those pages that are subject to paging. For example, AWE memory mappings and large pages never appear in the working set. Hey Alex! Thanks a lot for reading it over. I've added some of your suggestions, with attribution. Really appreciate it. The updated kernel address space layout just barely fits into the diagram - phew! I do plan to talk about the kernel VA regions in more detail in a future article so I've left those descriptions out for now. Cheers! Are shared pages pageable ? If yes, how does the memory manager walks all currently active PTEs for the given page to mark them as invalid ?